From the unique flavors to the incorporation of an apostrophe in the i of its logo, Jeni’s Splendid Ice Creams is a cozy, friendly, neighborhood kind of ice cream parlor. 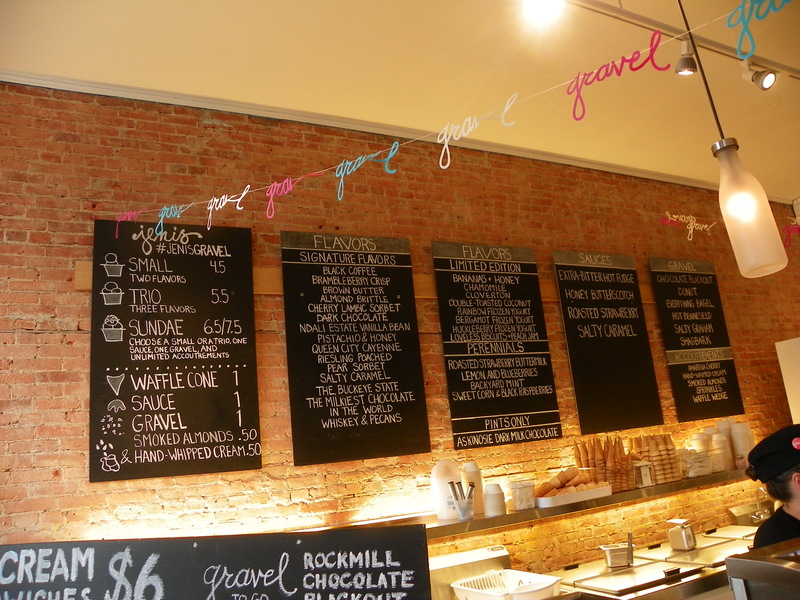 Although neither small nor especially local, Jeni’s still made my list of “green restaurants” around Cleveland. I can justify this decision by its rare business approach and one-of-a-kind array of flavors which boast many Ohio ingredients. 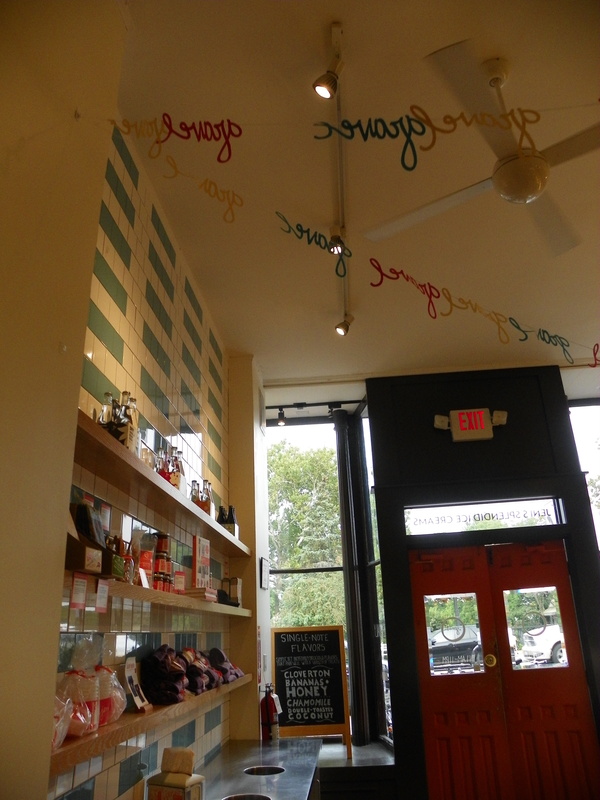 On Jeni’s website, the creator claims that her milk comes from grass-fed cows and the Snowville Creamery in Pomeroy, Ohio, near the southern border with Kentucky. Columbus boasts the majority of the shops in Ohio, but a few can also be found in Nashville. There are shops coming soon in Georgia and the Chicago area, as well. 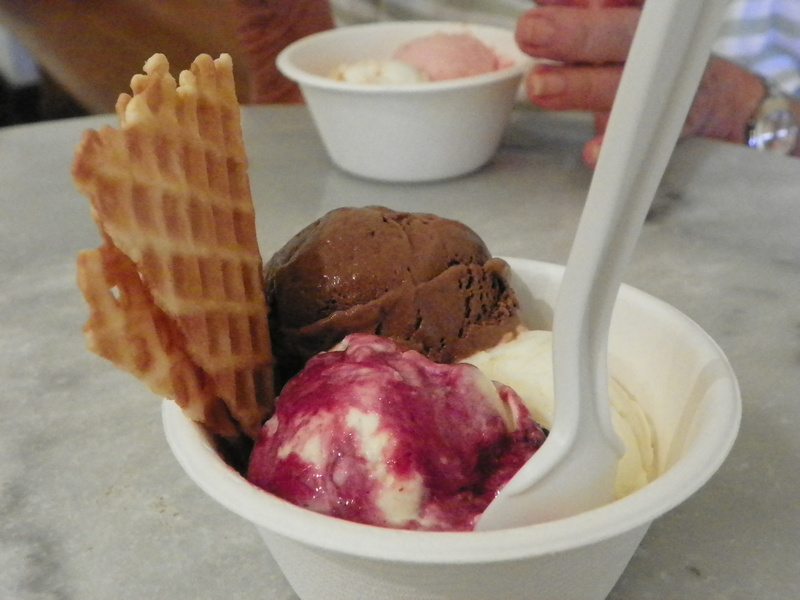 So while Jeni’s might not be Farm-To-Fork eligible considering its wide radius and growing reach, this unique parlor is notorious for its handmade and hand-picked flavors. 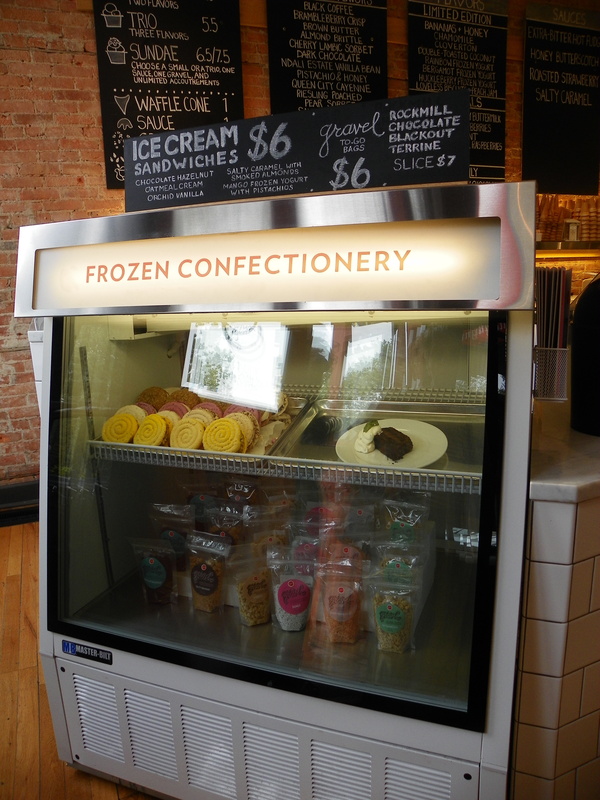 You can go to a Scoop Shop to get a dish, sundae, or even ice cream sandwich to taste the flavors or just order your own for home from the online store. The flavors currently being advertised include the following: Apricot, Askinosie Dark Milk Chocolate, Backyard Mint, Bananas + Honey, Bergamot (orange), Black Coffee, Brambleberry Crisp, Brown Butter Almond Brittle, Chamomile, Cherry Lambic (sorbet), Cloverton, Dark Chocolate, Double-Toasted Coconut, Goat Cheese with Red Cherries, Grapefruit, Huckleberry, Lemon & Blueberries, Lime Cardamom, Loveless Biscuits + Peach Jam, Mango Lassi, Ndali Estate Vanilla Bean, Passion Fruit, Pistachio & Honey, Queen City Cayenne, Rainbow, Red Raspberry, Riesling Poached Pear (sorbet), Roasted Strawberry Buttermilk, Salty Caramel, Sweet Corn & Black Raspberries, The Buckeye State, The Milkiest Chocolate in the World, Whiskey & Pecans, Wildberry Lavender, and Yazoo Sue with Rosemary Bar Nuts. 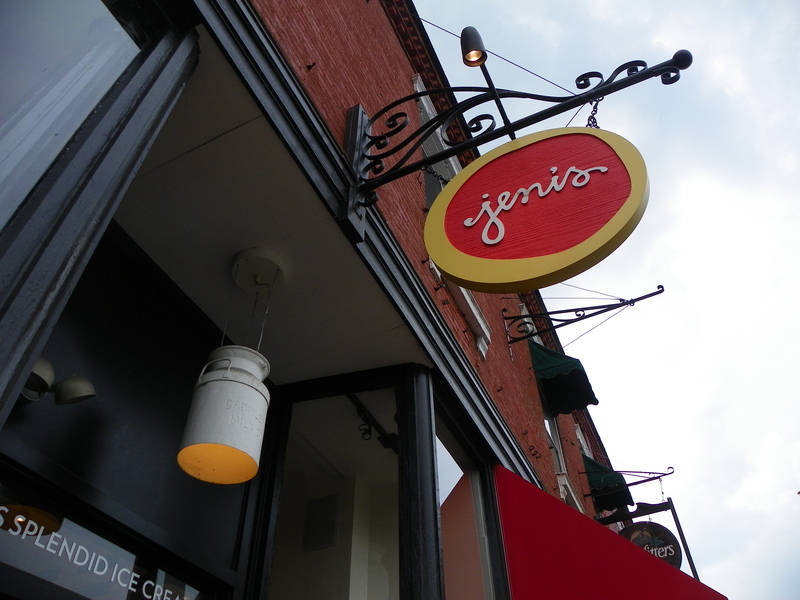 After spending the day in Shaker Square, my grandma and I took a short trip over to Chagrin Falls on the way back to Pennsylvania for a snack at Jeni’s. 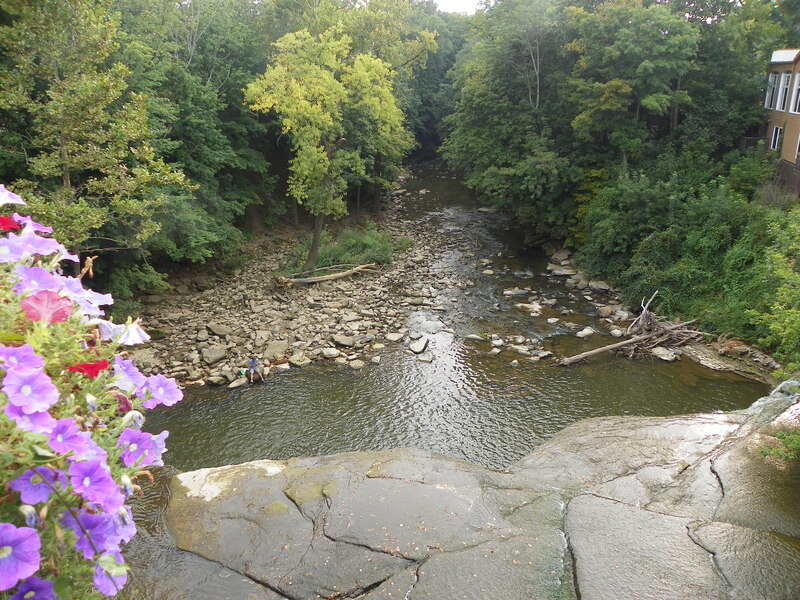 Chagrin Falls is a quaint Cuyahoga town near the Geauga County line and the shop is just as quaint as its surroundings. We were welcomed by the typical large chalk board menus with handwritten titles and cute homemade country decorations. My grandma tasted a few different flavors before settling on two scoops: Loveless Biscuits + Peach Jam and Roasted Strawberry Buttermilk. I wanted to maximize my experience, so I went with three: Queen City Cayenne, Sweet Corn & Black Raspberries, and Chamomile, complete with waffle triangles. The scoops were very tiny and our dishes were $4.50 and $5.50, respectively. We sat inside the shop to finish our ice cream and sip on cucumber water from the free jug at the counter. The cayenne was spicy like I like it, reflecting traditional Mayan hot chocolate (minus the cream and sugar). Sweet corn sounded like a perfect match for ice cream when I saw it, and the berries added just the tang to counteract the sweetness. Chamomile compared to the other two was subtle, but my grandma particularly liked its strong, flowery taste. My grandma’s peach scoop was just what I would expect, real peaches with crunchy cookie bits. Her strawberry scoop was creamier and more realistic than any shop strawberry that you’d find at a grocery store. When we were finished, my picky, small-eating grandma gave herself a pat on the back for having finished her entire order of ice cream for the first time in as long as she could remember. 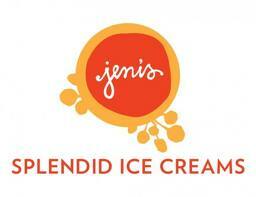 I would much prefer eating ice cream at Jeni’s than Coldstone, the other popular choice in Cleveland. 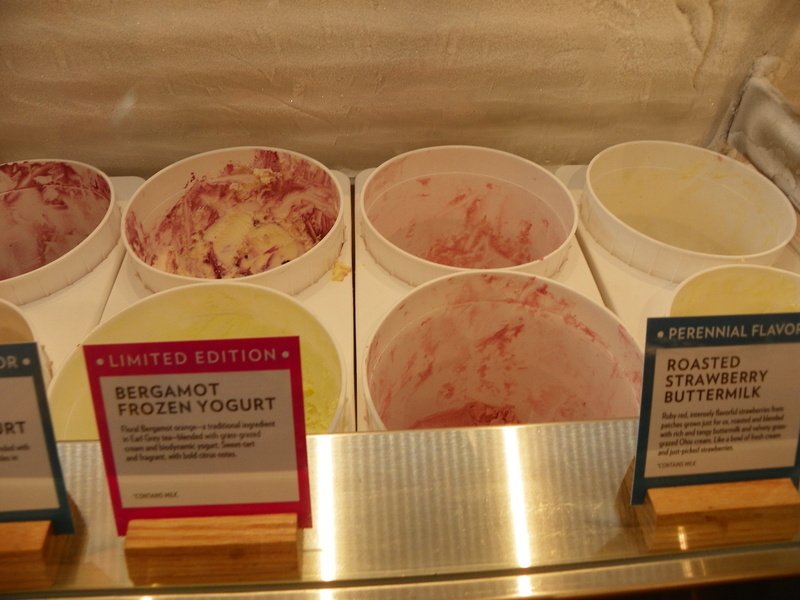 At Jeni’s, you can get some real, savory flavors that remind you that not everything has to be in enormous portions and obliterated with gobs of sugar and fat. You can learn to appreciate flavors like corn and zucchini and not always coat your sweet tooth with sugary berries and fatty caramels. In fact, going to Jeni’s has inspired me to get back into my homemade ice cream-making. This time, I’m looking at developing some soy ice creams on my home churner using some herbs and other summer ingredients from my backyard! 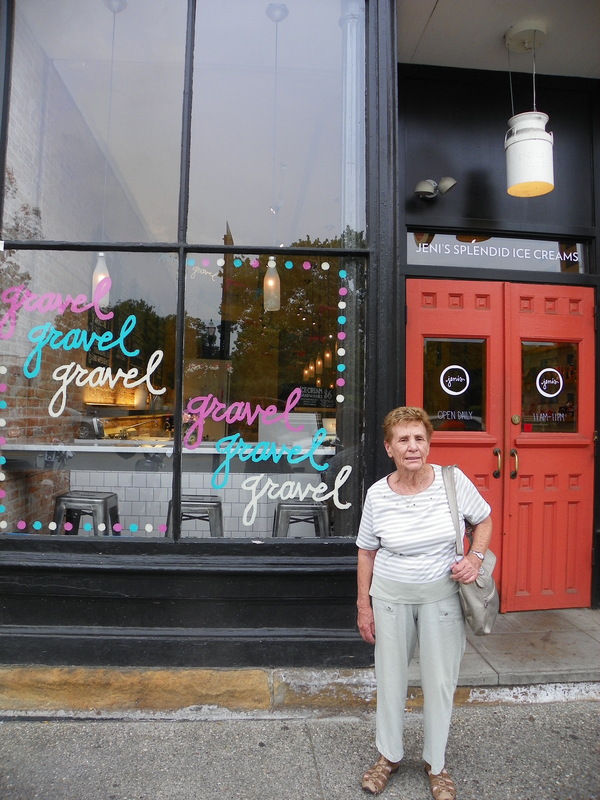 Grandma at Jeni’s by the falls. Looking in to one of the freezers. Our selections in their tiny, European-style proportions. Decorations reading “gravel”, the name given to Jeni’s cookie crumble topping. Looking down on the falls from outside. Cleveland Independs is a group of locally-owned and locally-sourced restaurants around Cleveland and northeastern Ohio. (See my previous post for more about Cleveland Independents.) One of the big promotion events Cleveland Independents holds is the idea of a “menu fixé”. Each resturant has a meal line-up of several courses for a fixed price. The price varies slightly, but line-ups seem to run from $15 to $40, depending on the place and if it is a lunch or dinner line-up. To be perfectly honest, researching how exactly to define the “Restaurant Week” concept was no easy chore. I had to search each even individually to make an appropriate summary of the event. This past “Week” has lasted for nearly 2 weeks and is the 6th annaul event. After investigating past events, it appears as if this “Week” is often more than 7 days and occurs once in February/March and often again in November. Its popularity has caused it to increase from a small amount of restaurants downtown with one meal line-up to over 50 restaurants with dinner and lunch specials. To encourage customers, parking has been reduced to $2 downtown in past events. The idea of Cleveland Restaurant Week is to encourage people to dine at local places to help stimulate Cleveland’s economy. After reading some comments online, I can conclude that many, many Clevelanders look forward to this event and a large portion of them spend hundreds each time by taking their families out. It’s a great way to bring the community together while simultaneously improving the Rust Belt city’s economic situation, one stride at a time. The event current at the time of this article’s publishing is the 6th annual week, held March 4th through March 16th, 2013. Restaurants are subject to change with each event, but all current event information and menus can be found at www.clevelandindependents.com under the Events tab and listing. Ohio City is a historic district in Cleveland with a lot of interesting food places, to say the least. One of its biggest attractions is the West Side Market. The concept was first conceived in 1840, then in 1912 the market came to be what it is today: an enormous indoor gathering with a plethora of vendors both inside what used to be an old train station as well as outside in a wrap-around arcade. For the most part, the vendors are family-owned businesses, but the West Side Market has evolved a step beyond a typical farmers’ market. The market is the oldest operating one in the country. It is open 7am-4pm on Mondays and Wednesdays, and 7am-6pm on Fridays and Saturdays, just down the block from the Ohio City Farmers’ Stand. The station is at the corner of W 25th and Lorain and has been on the NationalRegister of Historic Places since 1973. My friends and I decided to drive over to the market yesterday to get a few things, including lunch. The streets were packed with people. Apparently some festival was going on right across the street from the market. I’d never tried to drive to the market before (I usually take the RTA), so it was a new nightmarish experience for me trying to find parking. The nice thing about the West Side Market, though, is that so many people go to it. It’s commonplace to see loads of people carrying cloth shopping bags and stocking up. My friends and I ran into numerous other friends within minutes of getting out of our car. Apparently a lot of people buy their groceries here regularly, plus tourists come in from out of town to check it out. The stands are mostly produce in the arcade, but indoors they range from restaurants to delis, etc. You can find just about anything and including something from nearly any culture. In the past, I have stuck to the basics: bizarre popcorns from one stand, bubble tea from an Asian family, falafel from a Middle Eastern stand, olives from some Italian booth… My grandma always comes to one of the butcher’s to get some obscure cut of meat that she can’t find in Pennsylvania. Yesterday, we drooled over the baked breads, molded cheeses, and finally settled on some Irish pasties. To my disappointment, there was no HP sauce… but it was so good I hardly needed any! From the top of the balcony in the main part of the market, my friends and I took some pictures and watched the crepe makers beside the aromatic coffee stand. It’s hard to believe how packed this place gets, but it does, and it does all the time. One thing I love about the market is its convenience (and the tradition that comes along with it). One thing that bothers me, however, is that it’s really just a bunch of vendors. There’s no particular theme. What I mean by that is there are no “organic food” or “local food” or “family operated” labels. For example, many fruit stands have the same things you see in stores: unnaturally large berries and other fruits, plus exotic things like bananas and starfruits. One stand took me off guard for having potatoes already, then I realized only some where grown here. The others were in sacks that said Idaho! 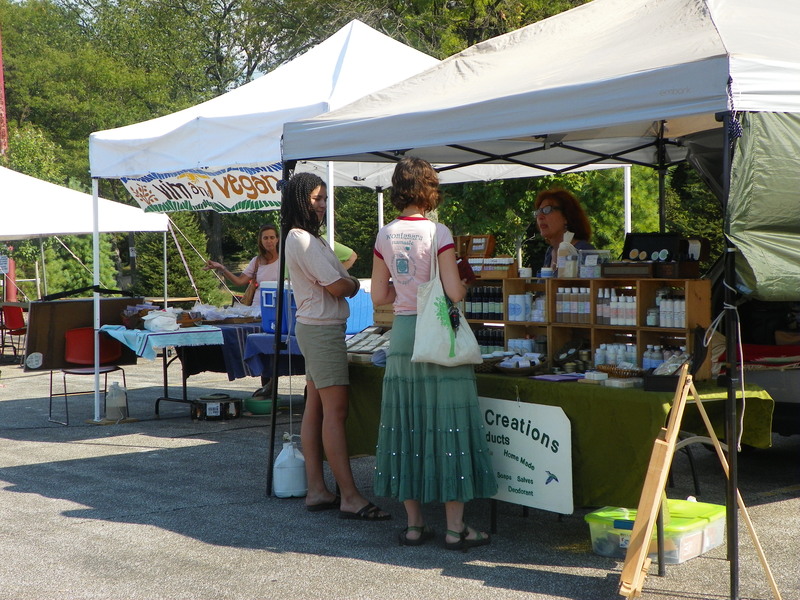 There was, however, an organic stand right across from it getting a good bit of customers. There was also an apiary stand and some homemade jams. To find out more, go to http://www.westsidemarket.org/. This morning, I decided to swing downtown to check out what Cleveland State University has been trying to set up in the city. 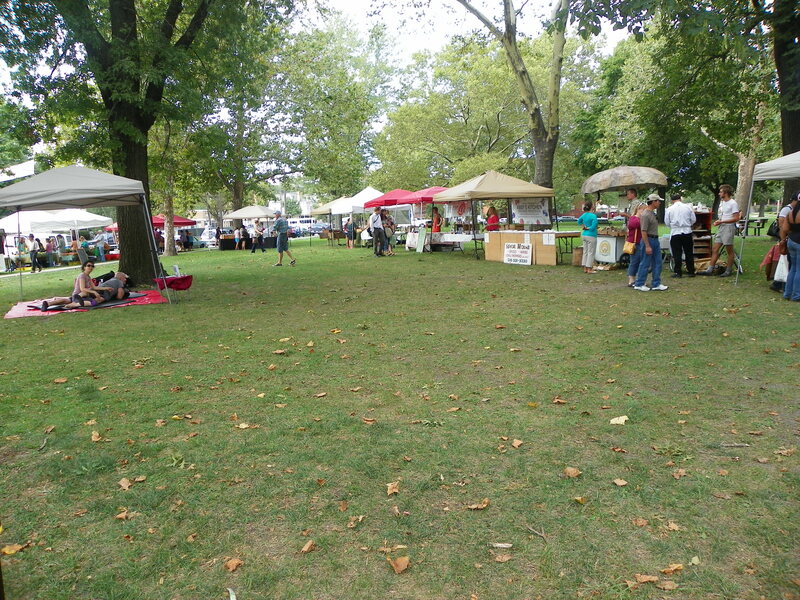 Here is a picture of the set up next to CSU: I found the vendors at 1930 Euclid Avenue at the Marshall Law school (between E 18th and E 19th Streets). 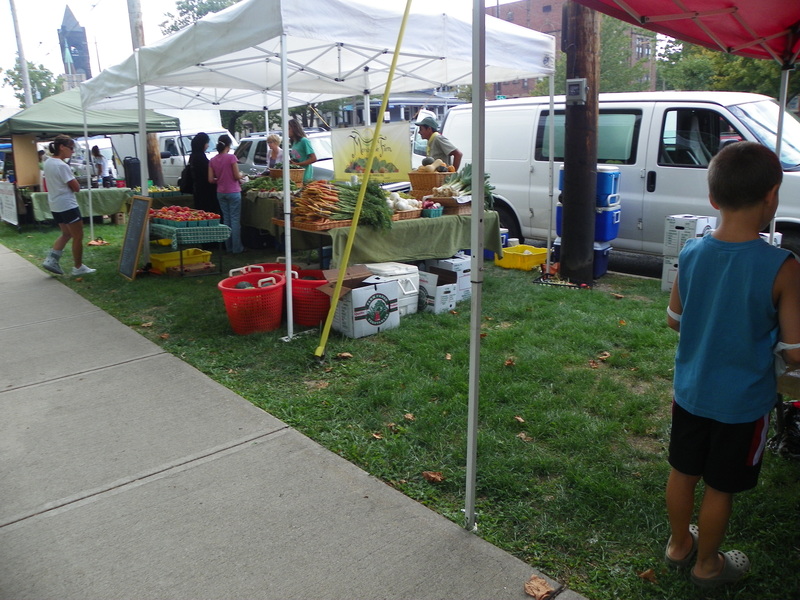 It was certainly a surprise to see produce in tents right next to a busy street! I can’t imagine how wonderful it would be as a student to have that at your fingertips. Unforunately for students, though, the market only lasts June through September. It is held Thursdays from 11am to 2pm. You can find out more at http://northunionfarmersmarket.org/markets/csu.html. 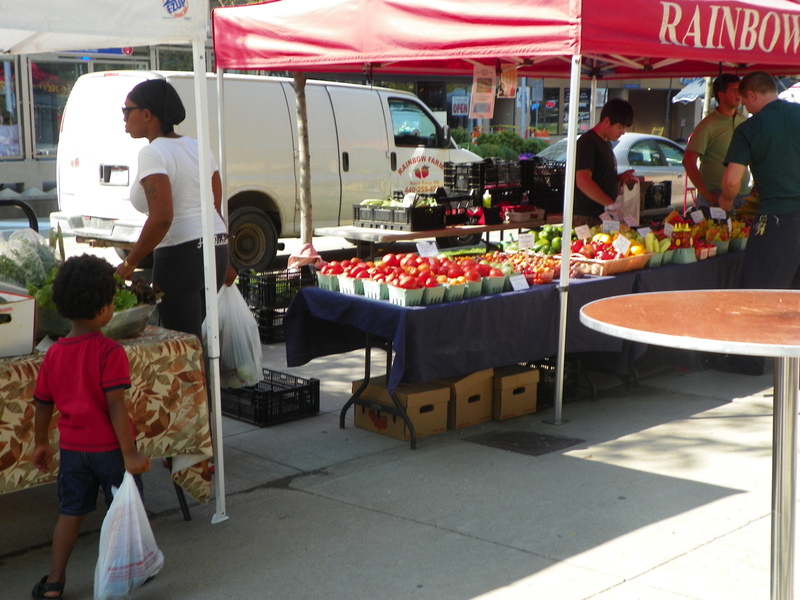 As with pretty much every farmers’ market I’ve encountered thus far in the city, CSU’s set up was also very small. A brisk walk down the sidewalk and I had already passed it. As with Tremont, CSU’s market had a slight carnival flair: there was live music (set up by Chipotle!) and even kettle corn at one vendor! 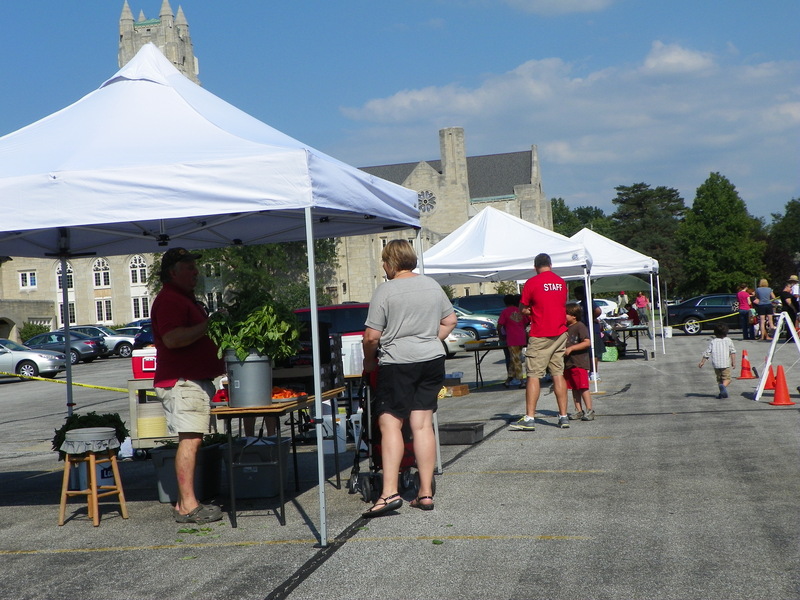 Within 15 minutes of set-up, there was already more produce here than at the First Baptist Church. There was also grass-fed dairy products and baked goods. If I were a student or someone working or living just down the street, I would definitely stop by here on a regular basis! P.S. 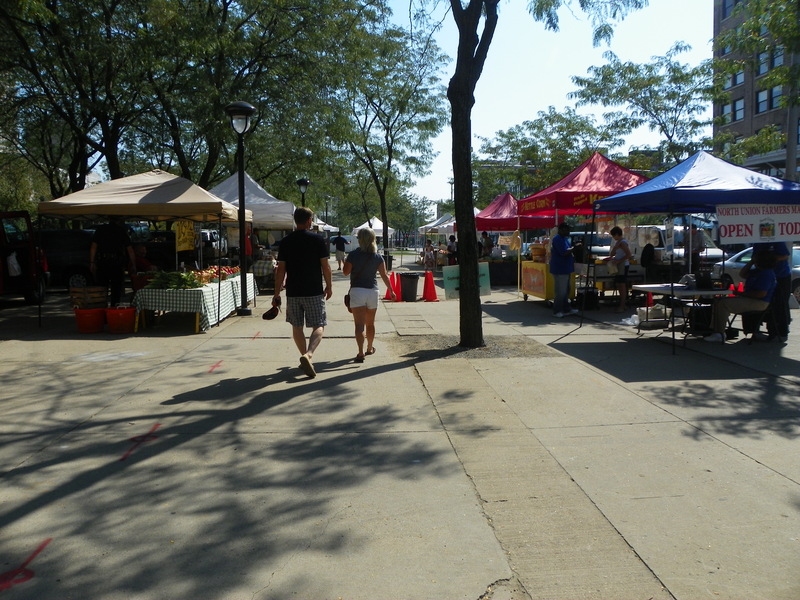 (You can see this in a separate post, but:) I left this market to check out the one at North Harbor at the E 9th pier but was disappointed that, not only was there no parking anywhere convenient that I could find, but there were hardly any vendors whatsoever! Let-down! 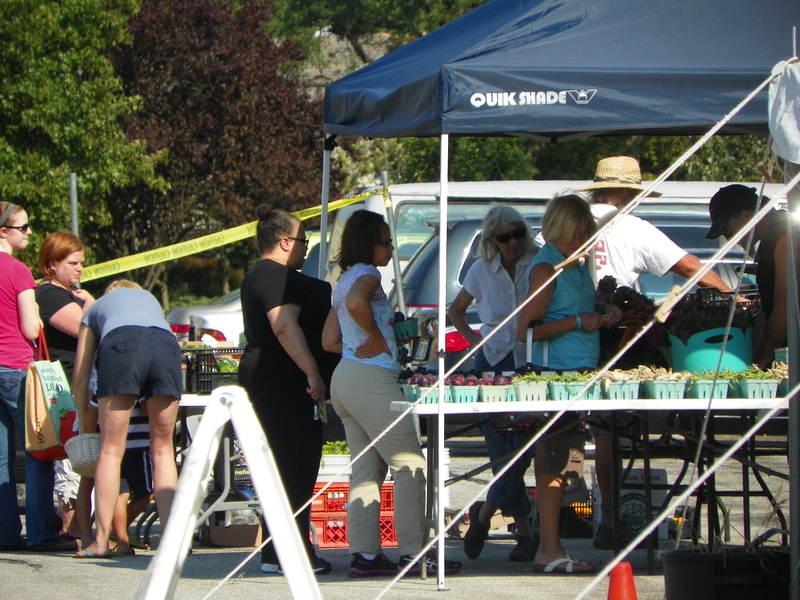 I got to the market yesterday, about 30 minutes after it started. I saw a woman walking away with a jug of milk. There were some bakers, farmers, and other crafty vendors, but the pickings were slim. Nothing like I experience in the country of Pennsylvania. The pickings were especially interesting, considering the advertised crops. According to www.localharvest.org, this location should have the following available by season: Summer – artichokes, arugula, asparagus, beets, broccoli, cabbage, carrots, Chinese greens, collards, sweet corn, cucumbers, Daikon radishes, eggplants, kale, kohlrabi, lettuce, mushrooms, onions, peas, pumpkins, radishes, salad greens, spinach, summer squash, tomatillos, tomatoes, turnips zucchini, avocados, blackberries, blueberries, boysenberries, raspberries, rhubarb, strawberries, beef, chicken, baked goods, bee pollen, bread, and honey; Fall – the same as summer except no pumpkins and, in addition, potatoes, cantaloupes, and maple syrup. I didn’t see most of these things. I did however see a cooler at one stand which I believe was selling eggs. They probably had the milk as well. True, this market is very tiny, especially the day I went it was. 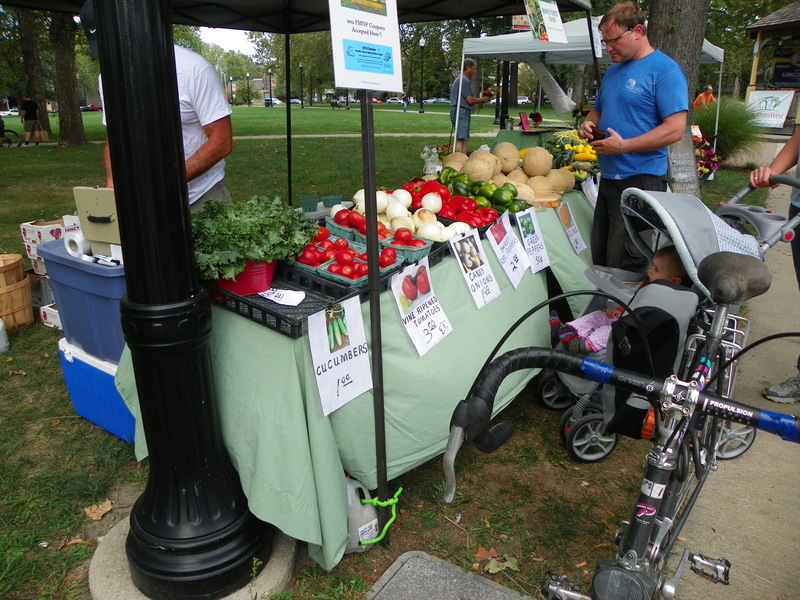 However, if you live in Shaker Heights, why the heck not check it out? If you’re ever looking for some fresh produce and know you could use some fruit or vegetables to stock your fridge, definitely swing by a place like this! No matter how small, you’re guaranteed to find something that will satisfy your needs. Generally, the prices are pretty low. Even if they’re not as cheap as Wal-Mart, you’re directly supporting a farmer, promoting carbon footprint reduction, and celebrating a sense of community with others! 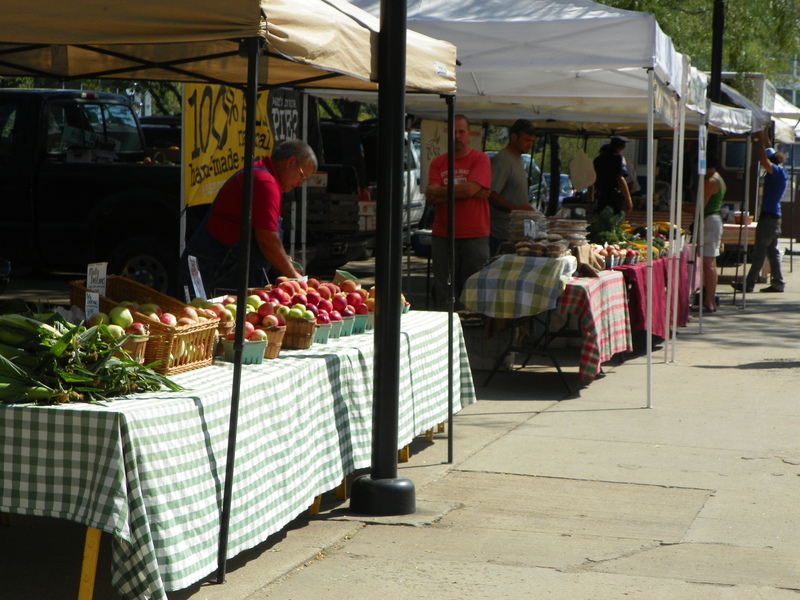 Farmers’ markets rock! 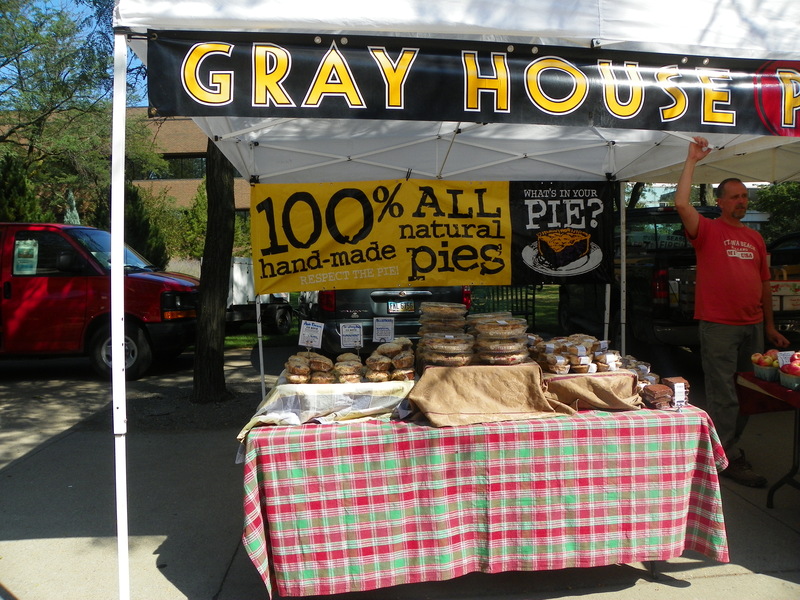 Yesterday, I decided to visit my first Cleveland farmers’ market! 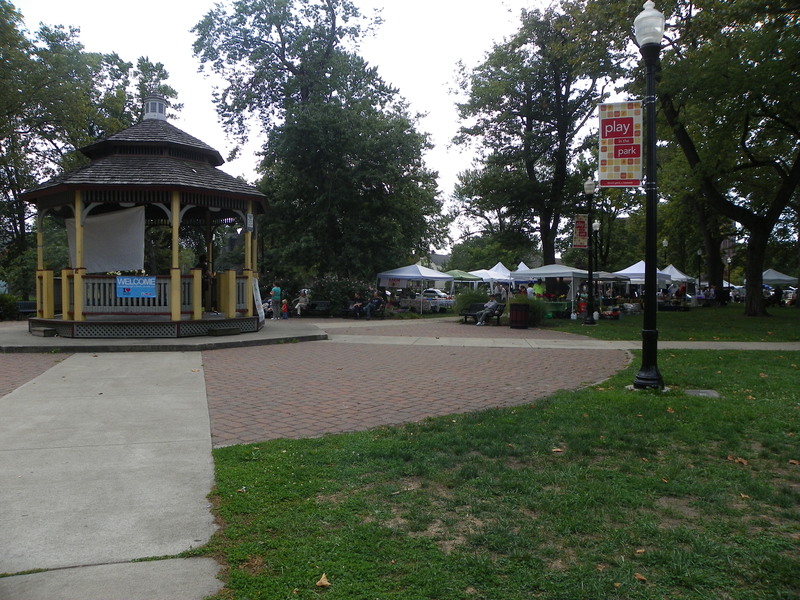 I decided to check out what Tremont had to offer… and, let me tell you, it’s not what I’m used to! But it was still quite the experience! The farmers’ markets I’m accustomed to are a bartering and/or selling business of mostly produce, but then some eggs and other small crafts on the side as well. 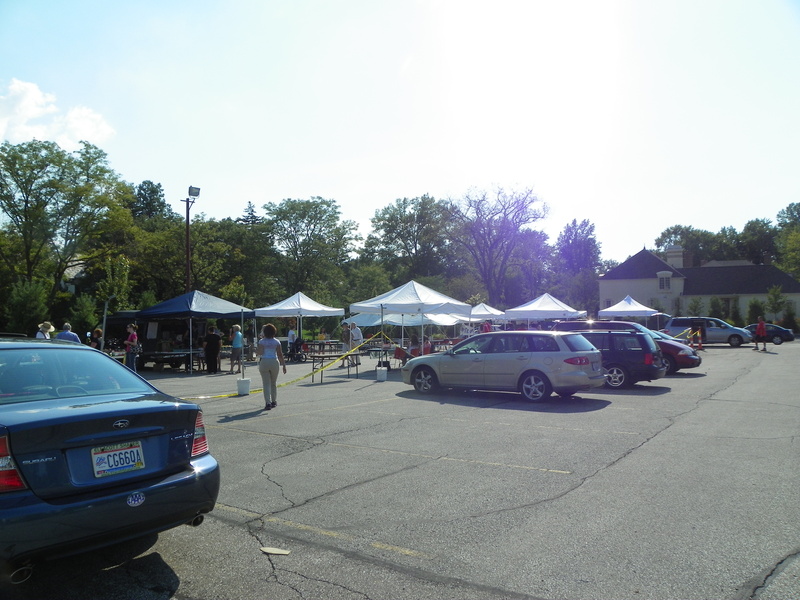 Here at Tremont, I arrived at about 30 minutes after set-up to find there were only a few produce stands. 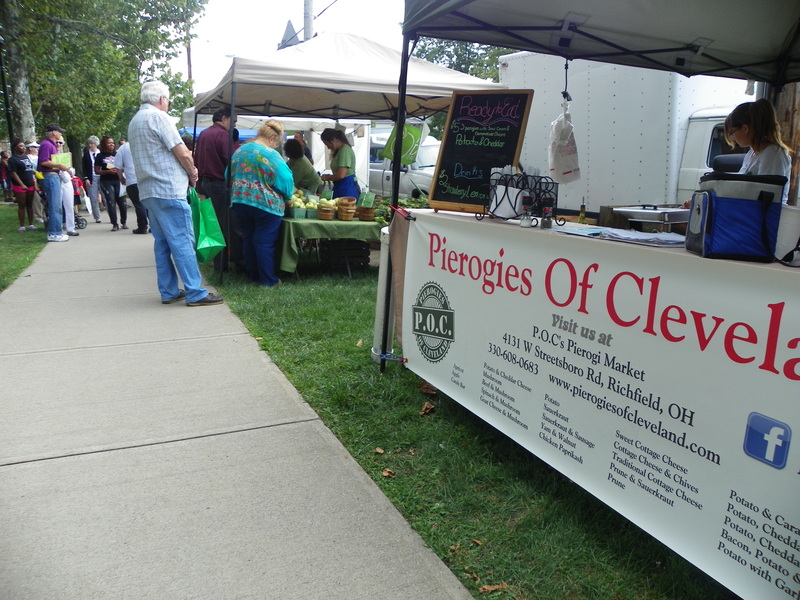 Most of the stands were offering obscure products, like ones for coffee, flowers, pierogies, and even massages! Plus, there was live music! I described this to my mom, who is familiar with the markets at home and those ones only, and she replied with, “Sounds more like a festival than a farmers’ market!” And that’s how it felt. The streets on all sides of the market were lined with cars. There was a constant flow of people down the sidewalk. I slipped around, eschewing much attention, and attempted to discretely take some photos of what I saw. I noted only one stand had an Amish family selling, many of them seemed to be company-ran rather than small farms, and that not all stands were set up yet. I checked into the market on Foursquare and realized the mayor was in the house… so you can bet this is the place for regulars! I’d definitely go there all the time if I lived close. I hope to check out a market at Shaker in the next hour. I hope you enjoyed my scoping out this market!